We have recently completed our redevelopment of the practice to accommodate the needs of 21st century health care. This includes separate rooms for the cleaning and sterilisation of our instruments. Infection control is taken very seriously and all of our staff are trained to National Standards. We have stringent practice protocols and policies in place to ensure that our procedures are of the highest standard possible. 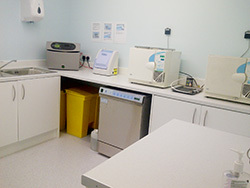 Our dedicated cleaning rooms are fitted with latest cleaning and sterilising machines. We have one LDU on both levels of the practice and they serve 3 surgeries each. Website design by Advertisingworks Scotland Ltd.